UPDATE: 05/02/2018 - Wow it's been so long but I'm ready to show how far we've come along, this post is still be updated in the coming week but in the mean time, read up on the latest update from my post today! Project Overview: Introducing Brock Crocodile! 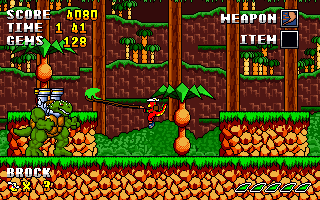 A platform adventure starring a 30 year old red crocodile that draws heavy inspiration from 16 bit platfromers like Monster World, Sonic the Hedgehog and Quackshot. The game is a single player experience that aims to deliver a mix between fast paced platforming, exploration and simple run and gun/combat gameplay. I've been working on Brock Crocodile since 2009 but now have started full development and looking to speed on finishing the title. The game is being developed using Clickteam's Multimedia Fusion 2. The game is currently being developed for PC only. 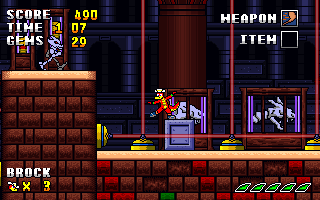 The gameplay in Brock Crocodile is split between the hub town the player can visit to purchase powerups and the levels Brock must complete to progress the story. The game is designed in a linear fashion but the players can always revisit the stages to find whatever they overlooked. In the stages, Brock will be able to use his whip to take out baddies and use it to swing across pitfalls or interact with the background. If you prefer long distance combat, no problem! Brock comes packed with a fruitgun too, which can either dish out one of your five a day or take down some goons. The game is set on the continent sized Crocodillian Island where Brock will venture from the local mountains to a bustling metropolis before venturing into the badlands in the east. 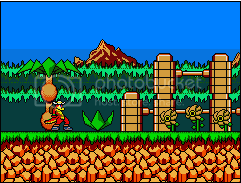 The aesthetics for the stages take strong inspiration from classic SEGA platformers both in art direction (Blue skies!) 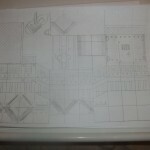 and level design. Each stage will hold a new gimmick and baddie for Brock to tackle. Sometimes you'll find you might be able to blast through them whilst other levels will require more patience if you want to overcome the obstacles in your way. Above all else though, I want to make highly replayable levels filled with multiple routes and secrets for the player to discover. Every good mascot game needs the baddies to back it up and I'm hoping I won't be an exception in this case! I'm designing each level to have it's own unique baddies, they'll be little reoccuring foot soldiers from stage to stage as the player will be taking on turtles, bees, tigers and all manner of fearsome individuals in boss battles of all shapes and sizes! If you looked at the screenshots and trailer and thought this looked like something you would find on the Mega Drive/Genesis, good! I'm a big fan of a lot of the oldschool platformers that appeared on the console ranging from Revenge of Shinobi to Ristar. But Brock Crocodile's biggest inspiration no doubt come from three particular games/series, Monster World, Sonic the Hedgehog and Quackshot. In both Monster World and Quackshot I loved the designs of the world and the gameplay whilst I appreciate the vast complexity of the level designs with the classic Sonic games and I draw a lot from those three titles in this game. Sorry if I rambled on, just pretty excited to finally start a devlog, a pleasure to meet all of yours acquaintances! The level title screen reminds me a lot of Sonic. I expect to see a demo 'cause this kind of game is mainly about gameplay smoothness. This is going to sound super picky, but the fact that the score, time and gems text are not right aligned to the same line really stands out to me. Looks cool though, I loved Wonder Boy in Monster World on the Mega Drive, if it's anything like that i'll certainly play it. Yeah, between Ristar and Sonic I really loved the title cards to both as a kid! I'm pretty happy with what I have for the demo but I want to add some added polish and getting the right tunes in place is all that's holding me back, hopefully sometime this and/or beginning of next month I'll get the demo out. Thanks! Without trying to be too like Monster World, I do want Brock to stand on it's own merits but at the same time, like Monster World, Sonic, Ristar, Quackshot etc, have the feeling it was designed to fit in with those games. A hard balance to maintain! There's already a substantial amount of work done on Brock Crocodile so in this update I'll just like to talk a bit about the history of the game. To do this I'll start talking about the main character and the first stage! Work started on this stage way back in 2009, back then I was eager to finally try my hand at code after taking a long break from anything game development related since 2006. At the time the one idea I really wanted to work and polish on and that was Brock Crocodile, a concept that started far back as I was a child. So I popped open Paint and started doing some pixel art. Not before long I finally finished my first sprite, Brock, and it's stuck with the project ever since. When I designed Brock back in my youth, with LEGO no less, he was slightly different but the core of the character remains to this day. 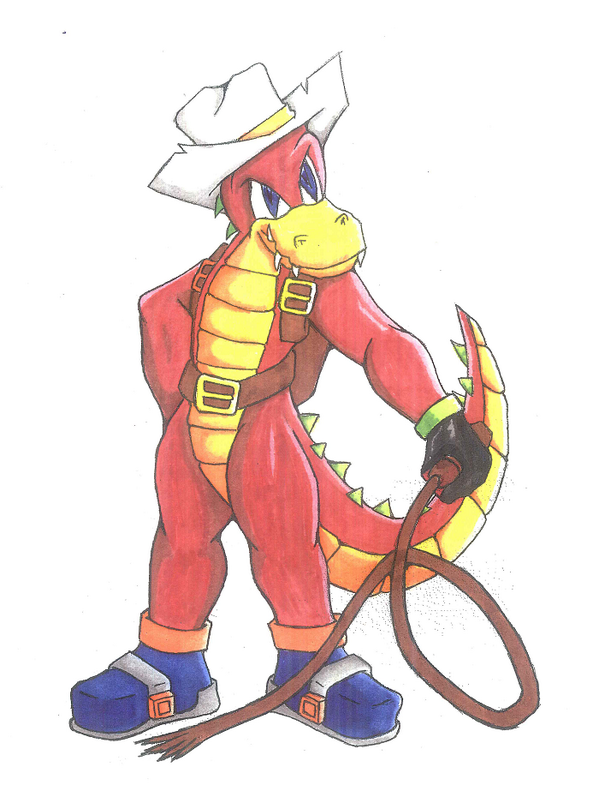 A red skintone instead of green scales, his hat influenced from the character of Dr Grant from Jurassic Park (And let's be honest, Dr Grant had a frankly awesome hat) his whip was to be able to swing across any sort of danger or scale anything in his way and give him close combat abilities. And his age of 30 years old, instead of a youthful character I wanted him to have a bit of age and experience behind everything he did. Finally I had put down on the computer screen what I was thinking about all through out my life and the ball finally started moving. But the added benefits (And drawback, singular, there was only one!) of having a bigger resolution meant I could play more with the design of the stages. Baddie placement was substantially easier now thanks to the player having a better field of view and it also meant I could tinker with Brock's top speed and acceleration (Which I am still having trouble trying to get right) and above all else, the boss battles. Before the change in the resolution it meant the boss battle where either cramped up in a small arena and or would leave the player's field of view, something I was keen to avoid. 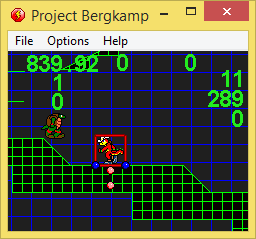 The one drawback meant that I had to the distance the secret areas would be from the player, but a minor issue at that. Not much of an update but I can now say we have officially launched our website! There's not much content on there now but I'll be trying to keep the website updated every Monday with new content from minor stuff like character profiles to the more major things like stages and more game information. A good friend of mine made it, if anyone is interested in getting in touch with him for website development I can pass your details onto him! I've heard this one a few times now :-P either the same person is stalking me through the internets or great minds think alike etc glad you liked it so far! Been ages since I last replied to this topic, time to resurrect it! So I've been working less on the levels and more on the hub section of the game. Looking at the dialogue box (Which was just a plain grey box.) I've changed it to be a black box with a white outline and it looks great. But I think the best change was adding a portrait to show off the NPCs, it forces me to do a bit more work but I think the pay off will be better characterisation as a whole for the project! Obviously they'll be loads more still to design, I think I'll have to make another 40 odd faceshots, taking a note from some oldschool 16 bit RPGs too, the mugshots will be blinking/talking when their speaking to Brock. Thanks for the comment but do you mind me asking what do you mean by the Freedom Planet comment? Are you talking about the storyline or general art direction? With this I'm aiming more towards something that would fit in the tone with say DuckTales/80sTMNT series, light hearted but with bits of, lack of a better phrase, cartoony seriousness (After all the villains are planning to take over the world.) 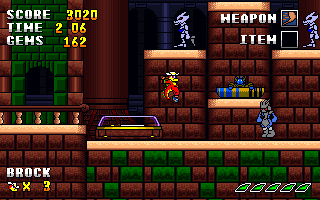 there won't be any sort of decapitation like there was in Freedom Planet. As you can see I'm not trying to limit them strictly with human anatomy (Even the humans are loosely based on it.) though the basic shape of a humanoid is there, yes. So whilst I got a devlog up here, thought it was best if I went a bit further in detail in the tools I used and a bit more on the history of the title. Consider this my first *proper* developer blog! Brock Crocodile finds it’s early roots back in the early 1990s when as a young chap I decided that I wanted to be a game designer. From designing the characters in LEGO bricks to making faux magazines posting previews and reviews of the title. 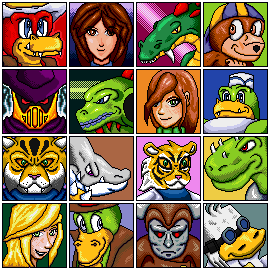 After a stint in various fangaming communities during the early 2000s I had come across Clickteam’s highly popular The Games Factory, a video game development program. The application used a range of GUI tools instead of scripting to help allow users an easier way at designing computer games. But it was not until 2009 that I actually began designing Brock Crocodile. On a late Autumn day I finally decided that I should give my attention at actually designing the game I had planned to and so I set about creating the first Brock sprite. Opening up Microsoft Paint and using the basic palette as a guide to the colours I would use, I drew some nifty little circles and started attaching them together, before long I had the first official Brock Crocodile sprite! But I did not stop there and quickly after completing Brock I went straight for designing the first area the Gazadiaz Ruins. Looking back at it, whilst the same Brock sprite has remained through from 2009 the first stage has changed considerably. Now with more shading in both the foreground and background with much more detail, I opted to abandon the strict restriction on the palette limitation I set on myself. 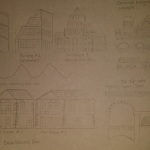 When it came to designing the levels I originally opted to once again use Microsoft Paint but found it much more effective and efficient if I used the good old fashioned pen(cil) and paper. 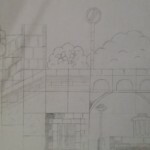 Another area that saw drastic changes as the project went into full production and saw me unfortunately scrap some good work but trying to implement my originally Microsoft Paint level designs lead me to the realisation they were just not as good as the new set I was making with my pencil and pad. I must have scrapped a good level of two worth of content but I’m not sadden by it, in fact I think what I have designed now is much more impressive! 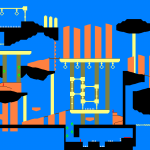 Compare the first half of stage 1 with that of the level design I created using Microsoft Paint to see what a massive difference it makes. 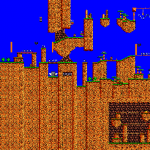 Another major contribution to the project was digging through level designs of classic platformers from the 1990s and it proved to be incredibly help at analysing what they did right and how they implemented an effective design centred around the game’s core mechanics. Now whilst the art may seem to some to have taken some time, nothing compares to the amount of time I spent programming the title. Thankfully the Clickteam community have a stockpile of tutorials on helping you learn how to use their programs and I finally dived in and discarded my old copy of The Games Factory I had from the early 2000s and decided to purchase Multimedia Fusion 2. Using various tutorials on Youtube and both the Clickteam official community sites as well as the many fan websites through out the internet, I eventually managed to get a hang of coding my first proper engine with Multimedia Fusion 2. From first giving Brock the ability to jump, then to walk, shoot, get hurt etc it all slowly added up. Ironically the core part of the gameplay, Brock’s whip, was the hardest and last core part to implement but finally after many stressful nights that too was accomplished! Another massive change that happened during the early production of the title was the resolution change. 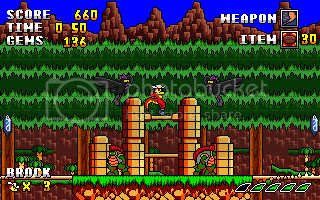 The original levels were designed with a resolution of 240 x 180 to try and stick with the same sort of resolution a 8 bit title would usually be restricted too. However in 2013, after finally completing the base engine I decided that to not only to push for a much more varied and better art direction (By giving myself access to a wider range of colours.) I found a larger resolution would allow for a much less cluttered screen that was being suffocated with the HUD taking more then I would like of the vital space. More importantly though is that it helped the player avoid colliding with obstacles and enemies. 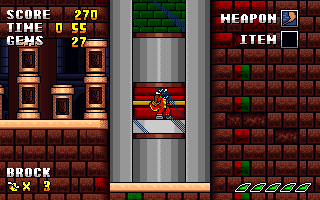 Finally, the window size was upped to 320 x 200 (Closer to games found on the SEGA Mega Drive.) allowing me to space out the levels just a little bit more and allowed for a much better swing radius for a key component in Brock Crocodile, the use of his whip. Brock gives you a thumbs up for reading the whole post! This wraps up the history lesson for the project, I hope you all enjoyed reading about the project a bit and please look forward to more developer blogs where I’ll be going more in depth from things such as level design to the coding of the game itself. Thanks again for reading and look forward to many more updates coming in the future, till then enjoy your Monday afternoon people! Been a while since I updated this blog but the project is very much alive. 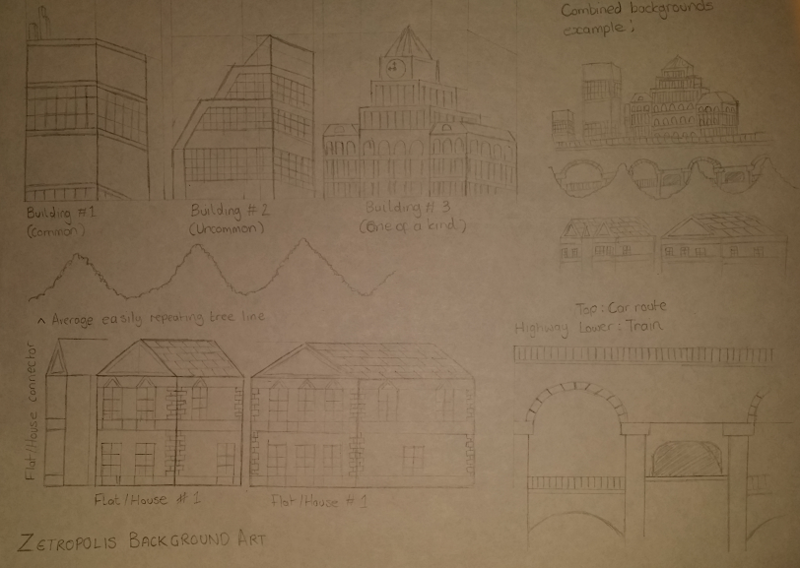 Started work on the 4th Level, City Lockdown, and had only some basic placeholder graphics whilst my level artist for the stage, Matthew Weekes, finished up bringing the concept art to life. On my end I've been busy animating the characters to get rid of the placeholder baddie art (Up top you'll notice Mikey is a stand in for a Gunther the Monkey and Russell the Ape is a solitary frame.) and completed the idle animation for the barrel throwing enemy. Chest beating, very generic ape waiting animation I know! Developer's Blog #2: Updates and Progress. First before we start this developer blog, Happy New Year everyone! I hope everyone had a warm and fuzzy festive period with friends and family. I thought I might try my hand at giving a bi-monthly report from now on. It lets you guys know the the project is alive and kicking whilst also letting everyone interested know how everything is coming along. So without further ado, let's get the second developer's blog running! 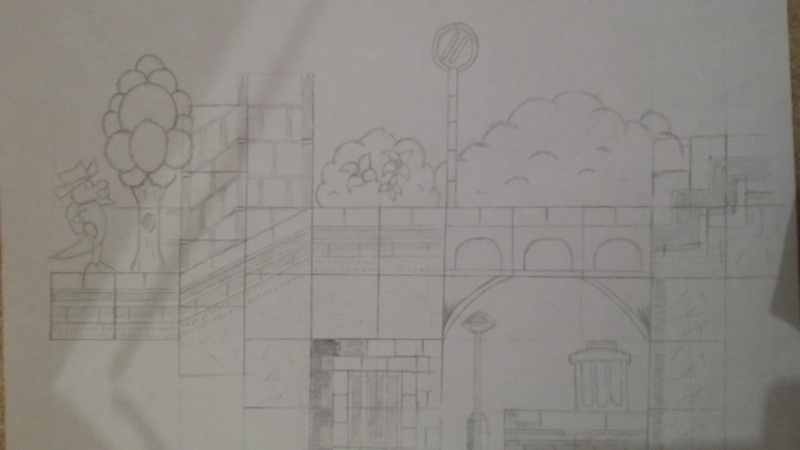 Some concept art for the fourth stage, City Lockdown. Also introducing Stick bean Brock! 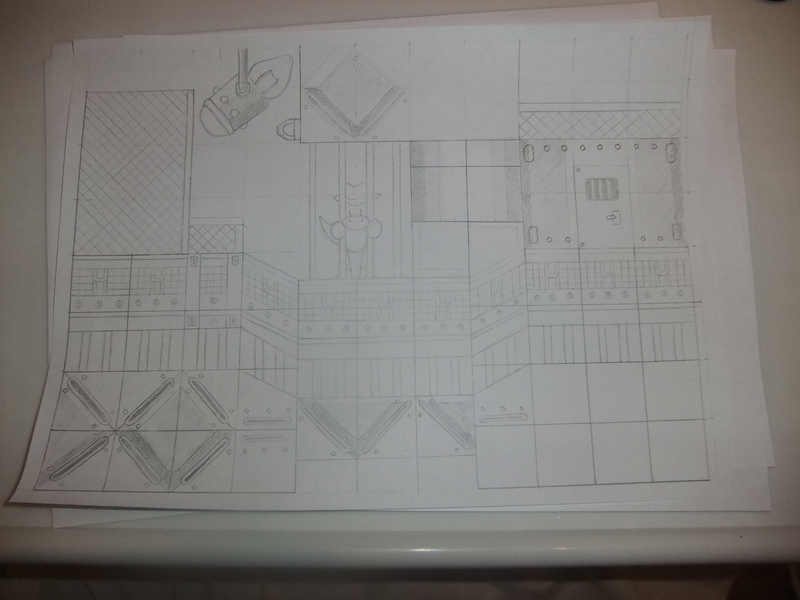 So far this January I've started planning out the level design for Breakout Prison and working on the concept art. 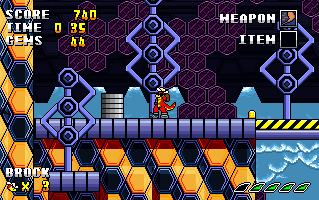 In order to keep things fresh I've decided to exclude any sort of baddies from the stage safe for a few secret ones used to help boost a player's score. In terms of the speed I'd describe each stage as the following; Gazadiaz Ruins (Fast) Beehive Battleship (Fast) Museum Mayhem (Slow) City Lockdwon (Moderate) Breakout Prison (Slow) I'm really hoping that this mixing up would help differentiate the levels apart from another, of course it's a dangerous method too, I don't want the gameplay to slow down excessively that it'd bore players. Although it does share a gimmick from Museum Mayhem (Laser beams to turn on and off.) the stage is also equipped with flamethrowers that are activated when the player is spotted by a search light, retractable spikes, floors, doors and also a mini-puzzle where you'll have to insert coded boxes into the floor to open a door. It definitely is aiming to be a bit more time consuming than the prior two stages (That should be completed within 3 to 4 minutes in total.) since it's the only level in the game that has a single stage baring the final level. And again barring the final stage, this one has the lowest number of alternate routes. Coming off of City Lockdown that had upwards of 16 different paths, I'm gunning for a more linear straight forward level with maybe 2 or 3 different routes the player can take. Work in progress sprite for Lankeyarms. Now back to Lankeyarms, just like with the stages I'm hoping to keep the bosses fresh. An elderly primate dressed in a fashionable sharp white suit, he jumps around from the stage using his steam powered gauntlets that jettisons him into the air and tries to land a spinning roll on Brock. Failing that he always has a few handy banana grenade's to throw at our scaly protagonist. Lankeyarms leads a group of monkeys and apes to assault Serena City and capture it's mayor after botched attempts at stealing the artifact Brock recovers in the first stage. A thing to note about him is that he is so far, the shortest boss Brock encounters in the game and the second shortest overall (Brock's rival, Egaunodon, is the shortest being as tall as Brock) so trying to take him out with anything but your whip could be difficult. That wraps up this developer blog, I hope you enjoyed reading it and one of my goals for this coming year is to start churning these out on a more regular basis. Until then folks! Welcome again for another insight into the development of Brock Crocodile. On this week blog I’m going to be talking about a central component in the game, the boss battles! Bosses are one of my favourite moments in video games, they can go from hectic shootouts to downright brink of sanity crazy. The first thing I do before starting any boss is designing the character themselves. Having the most awesome boss battle means very little if the character themselves aren’t memorable. I tend to look at titles from the Yakuza series as some of the best boss battles in gaming and how the games’ constantly take liberties in the fights to give the bosses some rather unrealistic special powers. I’m also trying to avoid repeating myself, the first four bosses range from a giant turtle with plasma cannons embedded in his shell to the current boss, a smartly dressed, elderly and slender ape with mechanical gauntlets. The next bit would be getting a rough idea of the boss’ attack pattern and fighting style. This however depends greatly on the prior bosses as well as some future planning of later bosses. For example outside of his plasma cannon the first boss Pummell Gunzhell attacks by retreating into his shell and rolling towards the player. 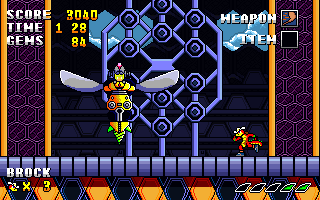 The following boss Princess Cassandra would hover around in her bee mech before trying to impale Brock with her stinger. The difference in both bosses are more than just aesthetics. Whilst Pummell’s attack’s can be dodged by jumping in one spot, Cassandra requires movement to get out of the way of her attack. The way to attack them is different too, you can get a few whip attacks on Pummell whilst footed on the ground but Cassandra requires Brock to jump to reach her hitspot area. With that in mind and with the third boss following Pummell’s method of attack and opening, Lankeyarm is closer to Cassandra. Originally Lankeymonk was meant to be swinging back and fourth but I deemed that a bit too similar to Cassandra so soon and just a bit too difficult for the fourth boss too. He was always going to have specially designed gauntlets but they were to give him extendable limbs in a sort of Dhalism-like way but now instead uses them to jettison himself into the air. 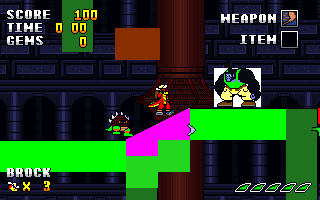 Once he reaches the end of the screen the game gives the boss a choice to either initiate his second attack or go back in the opposite direction. 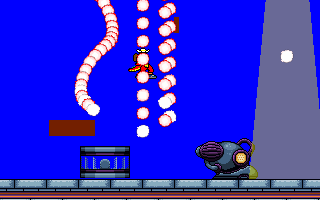 His second attack occurs when he hangs off the ceiling and pulls out three bombs after which he tosses them into the air. Once they’ve landed the players must judge depending on how fast the bombs are flashing to correct guess which bomb will go off first and position themselves next to the bomb that will go off last. 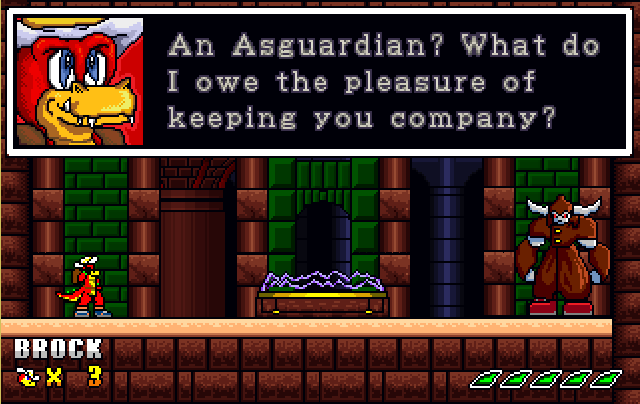 Another thing that was introduced with the previous boss, the Asguardian Golem, was the boss slightly changing their attack pattern based on their HP. This will not necessarily occur with all the bosses and some will even have totally different forms but it’s just one of the many ways to keep certain battles fresh from others. With Lankeyarm, this difference is less to do with more aggressive attacks like the third boss but more to do with giving the players less openings to attack the boss with. Once a basic moveset was done it was finally time to let some people review the boss fight. A few friends (Shout out to Farzana and Bruno.) suggested the boss was a bit bland so in the name of variation, Lankeyarm changes the height of his jump and the speed (Moving as fast as Brock.) at set intervals. It certainly adds a lot more challenge to the battle and definitely means players should be cautious when attacking Lankeyarm at certain sections but not too hard that he would be out of place as the fourth boss. You can check a demonstration of the boss battle (Without the animation unfortunately!) above and one funny glitch I encountered. That wraps up this developer’s blog, I hope you guys and gals enjoyed watching it and on a final note, we recently opened up a Facebook page, drop by and give us a like/share if you can! Till next time! 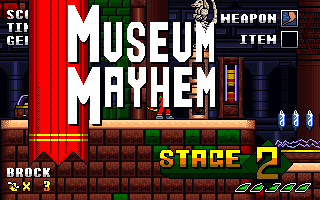 We've been showing off this stage on our Twitter account for sometime now but now is the time to officially announce the third stage, Museum Mayhem! After protecting an ancient artifact discovered in the Gazadiaz Ruins and stopping the attempt to steal it in Beehive Battleship, Brock finds there's some mysterious goings on in the museum that threaten the artifacts safety again. Spirits of warriors passed long ago, mummies and living demonic skeletons wander the halls of the museum... But is everything as it seems? So far in the development of Brock Crocodile I definitely had the most fun in designing this stage. It also, combined between both stages, the smallest level so far in the game but don't let that make you think it's the shortest. Completing either stage should take you more than 2 minutes even knowing the most effective route to the goal. While Gazadiaz Ruins only had baddies standing in your way and the Beehive Battleship need you to wait for hoops to drag you to the next location, Museum Mayhem has a few different kind of obstacles. I also had the most fun in designing the baddies for this stage but that's a tale for another update. Until then head over to the stages section and read up a bit on Museum Mayhem. We've done some basic changes to our website now linking our Twitter, Facebook, Youtube and Google+ pages on the header and you'll find you can share or retweet this entry at the article's title. Hope you've had fun reading this and be sure to look out for more future Brock Crocodile content! It wasn't the most elegant of designs, you just touch it than you're rolling through the pipes in the beehive going up, down, left, right shake it all about! In then you pop out of the other side like magic. So I decided to fiddle around with that and came up with a proper, more cooler looking animation. First came designing a rotating Brock sprite, now I got to admit, I'm not good with my angles. I hate drawing characters from any other side of their body but needs must! It took me a couple of hours to do it but I produced a nice looking sprite. Welcome back to another developer’s blog, this time we’ll be taking at how we design a certain gimmick in the fifth stage, Breakout Prison, where Brock finds himself in the high security Navadash Prison. Jump in to get this blog post started! The level itself has one thing that differentiates it from the previous 4 levels and that is a distinct lack of bad guys, save for the 5 hidden through out the level that help the player reach the maximum attack bonus. Outside of that the player will simply be facing an onslaught of gimmicks that will attempt to impale, fry and electrocute our poor reptilian friend. With this in mind it really came down to making sure the gimmicks themselves had a bit more personality and above all else, managed to combine well together when placed in succession or together. The most important one would be the spotlight. I broke it down in two parts, first of all the spotlights that alternate between themselves and then the flames that start shooting out if the player is detected. First of all required research, as people are aware of by now that with Brock Crocodile we’re attempting to create a platformer from around the 90s. There were plenty of methods I found on how to do a flamethrower but all of them seemed far too advance so I decided to play some good old fashion classics from the 1990s. After seeing how it was done in SEGA’s 1994 release Sonic & Knuckles (Who says games don’t teach you anything!) it came down to trying to emulate it. This brought a lot of fun and quirky techniques that I learned after messing around with the Sine and Cos that should definitely provide some future use for me! Now to tell you how it’s done, I’m sure there is a more effective way of doing it but for someone who hardly programmed it worked almost as I wanted it to. The mask that creates the flame, which we shall call the generator from now on, has four different versions (Up, down, left and right.) 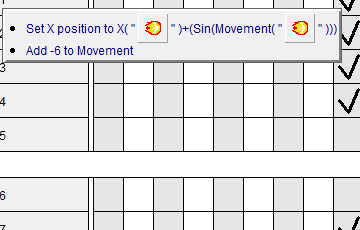 and one alterable value (Flame direction.) In the initial testing the game would create a dozen or so new flames every 5 seconds at each specific generator points. Once the flame hits the generator, a specific alterable flame in the flame would change (from 0 – 3 representing up, down, left and right.) once this happens, the current y position of the flame would be subtracted by 1 or plus 1 depending if it was going up or down and like wise for the x position if it was going left or right. Now depending on how far I want the flame to be to the right or left, a multiplication will occur. Finally after the flame reaches the end of it’s life cycle (Around .35 seconds.) it extinguishes, leaving its slightly younger predecessors to take the reigns as the top flame for the remaining .10 seconds of its life, ha! Next up the much less frustrating thing was to make the spotlights. The spotlights are controlled by an object, called the Prison_System from now on, in the background that makes use of it’s 5 alterable values (BrockSEEN, BrockACTIVATION, FlamecreationTimer and LightSwitch.) Whenever Brock overlaps a spotlight, BrockSEEN changes from 0 to 1 and 1 is constantly added to BrockACTIVATION and FlamecreationTimer whilst BrockSEEN equals 1. During this time the FlamecreationTimer creates one flame at the various generators and is reset to 0 every time it reaches 6 so we don’t have an overload of flames! Though you may ask how does Brock get past these spotlights? That one is easy, the LightSwitch is constantly adding 1 until it reaches the maximum of 120 when it’s reset to 0. At each successive 40, one light switch turns on and the other two turn off. A very simple system for a rather complicated secruity system in a prison! All in all, 3 days of work saw me complete the system which I think looks rather pretty and retro in motion. There’s still somethings to sort out (Such as where exactly the fire comes from.) but for now enjoy this GIF. I believed I’ve covered everything and hopefully you can take away with you the sort of planning that goes on behind the scenes to get something as simple as a flame to work in a game! I must admit when I first started working on Brock my preparation for gimmicks was step by step, I was just winging it, nowadays I plan beforehand, what is the system’s purpose? How is it going to do? How many parts is there to it etc and it’s helped me give greater admiration to some of the industry’s best programmers in the past and future who had to deal with vastly more complicated systems! Thanks again for reading and you can always share the link via our share buttons above the topic title, until next time! bruh you gotta desaturate those backgrounds. i cant see a damn thing. the purple is fine because its a different enough color from the player but this? this is really hard to see.